The AAXA M2 is a light, bright, highly portable XGA presentation projector that fills the gap between full-sized XGA projectors and tiny picos. Its 110 ANSI lumens put it in the perfect niche for the display of Powerpoint presentations and other simple documents to small groups. An LED lamp keeps you going without the hassles of maintenance. 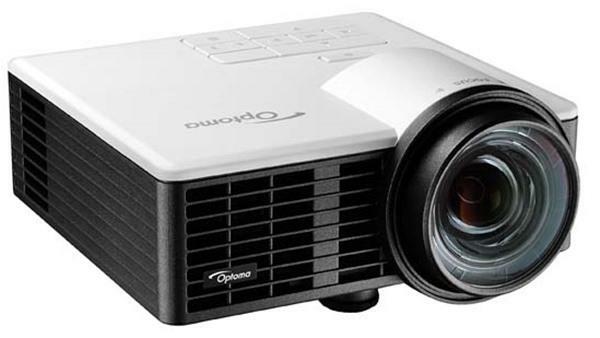 The projector's one-pound weight will please anyone who travels frequently, and its onboard media player keeps the required accessories to a minimum. If you've considered pico projectors but found them not quite bright enough, the AAXA M2 might be a perfect fit. At street prices under $400, it's a solid value. The AAXA M2 is built for mobile presentation and media display. The tiny M2 produces a maximum of 110 lumens using its LED light source. In a light-controlled environment, a 60" to 80" diagonal image has plenty of pop - enough to make your presentation look good for a small audience. With higher ambient light, a 40" to 60" diagonal image is bright enough to keep the image from being washed out. The M2 has a fixed focal length lens, so image size is entirely dependent upon placement. Note that a fixed focal length is not the same thing as a fixed focus; focus is manual and still needs to be adjusted once you've placed the projector. The M2 has a relatively long throw distance for any given image size, which is helpful when a conference table is several feet from the wall. With the M2's built-in media player, you don't even need to bring a laptop along. The M2 has several options when it comes to media storage, including 1GB of onboard flash memory, an SD card reader on the connection panel, and the ability to use USB thumb drives. Since an SDHC card can hold up to 32GB, a lack of storage space isn't likely to be a concern. I think this is a great projector. Bright enough, and good enough resolution to use regularly, but will probably not replace a television. I agree that the games section is kind of useless. The remote leaves much to be desired also. This little projector is not bad for basic HD TV watching. I am able to connect it to my Dish HD PVR and it a decent image (with some tweaking of saturation, brightness, contrast and color mode). I did run into some problems with my Blu-ray player, however. None of the aspect ratios available to me from the blu-ray were correct. They all gave me a squished image which I find unwatchable, however, a regular UP-converting HDMI DVD play worked OK. It not a replacement for a good home theater projector but as an everyday "watching TV on a 82" screen" device it is not too bad! What low lamp mode?The fans never change rpm.Also it has keystone. This review was done really well gave me all the information i needed prior to purchasing. all in all its a great projector that provides a good image even if the lumens are only rated at 110. I use this mainly to watch shows off my ipad, or laptop and its worked out well thus far. I bought this because there seemed to be good reviews all around but it has broken twice already after only a few uses. I take good care of it and use it sparingly. I wasted over $300 for nothing. JUST ORDERED THIS OVER OPTOMA, IT BETTER NOT DISAPPOINT ME! NICE REVIEW. Wondering if I could use this to hook up to my wii system to project larger image on the wall for party? I loved the M2, too bad it's discontinued, I'm looking for another similar model to perform the same thing, should I try to hunt for another used M2 or should I get their upgrade the OEM250? This is my second M2 and my second one with a fan failure. Does anyone know if its possible to fix this? Doubt AAXA has a warranty on it. Thanks for the invoice, I appreciate it. Looking at our current inventory, the M2 is a discontinued product, and has been since mid-2013. We had some remaining stock left in inventory but recently sold out, so I am unable to replace the unit for you, unfortunately. They were of no help, and I am disappointed in this product and the company. aaxa you just lost a customer, and I will make sure others will know about your company too! Same problem as *many* other users. It worked okay at first but now it powers on and shuts off after 10 seconds. AAXA gave me some BS about discontinued product and that it's probably a 'fan issue', whatever that means. This projector crapped on me after about 1 Year. Not worth 300 dollars. I will never buy any AAXA product ever again. I suppose I will hold on to it in case someone finds a fix.